​Washington, DC— Today, the U.S. House passed its version of a Senate-passed bill, S. 192, the Older Americans Act Reauthorization Act of 2015, signaling its support for the vital home and community-based services that the Older Americans Act (OAA) authorizes and funds in communities across the nation. This action means that the bill is poised to be sent to the President for signature as soon as the Senate endorses the House changes. ​The Older Americans Act provides essential services every year to nearly 11 million seniors, including information and referral assistance, in-home supports, nutrition programs, transportation, caregiver support, job training, legal services and protection from abuse and financial exploitation. 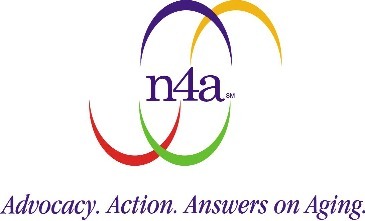 n4a applauds the House’s approval of this bipartisan measure, designed to modestly update the way the OAA achieves its mission of helping older adults age with dignity, independence and health in their homes and communities. In a statement, n4a CEO Sandy Markwood said, “Approval of House Amendment to S. 192 is a pivotal achievement that puts us much closer to ensuring that OAA programs will continue to support older adults to live with dignity and independence in their homes and communities for as long as possible. Our members, the 622 Area Agencies on Aging and 256 Title VI (of the Act) Native American aging programs, work on the front lines of aging every day, providing a broad range of services and supports that enhance the lives of older adults and doing their part to realize the vision of the Older Americans Act in communities all across the country.”“We look forward to working with Senate leadership and the President to see OAA reauthorization signed into law next month,” added Markwood.Having worked since 2011 with congressional leaders on reauthorization, n4a would like to the House leaders whose commitment to this bipartisan bill and drove its passage: House Committee on Education and the Workforce Chairman John Kline (R-MN) and Ranking Member Robert Scott (D-VA).